TOUR TYPE: PRIVATE EXCLUSIVE: Just for you! 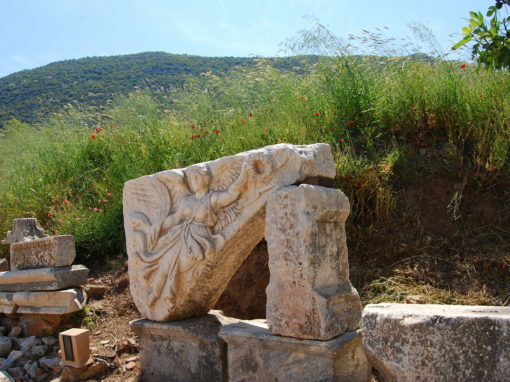 Village of Sirince or House of Virgin Mary & St John. 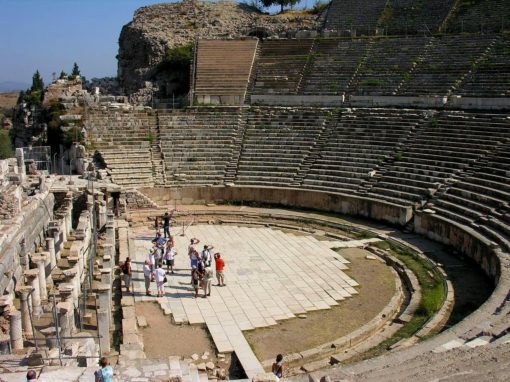 WHO WANTS IT: Want to mix the sightseeing the Spectacular Ancient Roman city as well experience the real Turkey life. PACE: Moderate – wear comfortable shoes. LUNCH: included at typcial local location. MEETING POINT: Directly as you disembark off your Cruise ship. 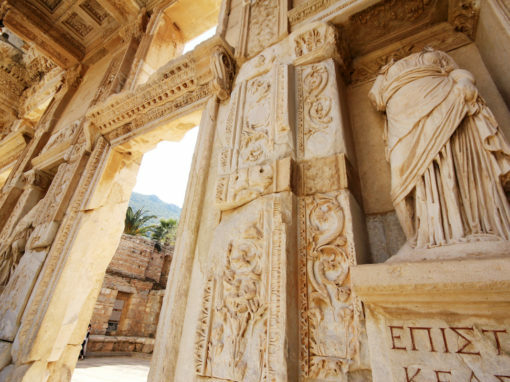 Luxury private transfers directly from your Cruise ship to/from Ephesus and Kusadasi. Private Tour guide just for you through all locations! The quaint village of Sirince nestled in the mountains. The narrow streets reflect the mix of Turkish and Greek culture. Should you want , you can also visit the House of the Virgin Mary believed to be her last home or maybe the Basilica of St John who spent his last years here and wrote his Gospel here. Lunch is provided for you away from the crowds in an amazing family run country setting and you get the chance to taste the diverse flavours of traditional Turkish cuisine. (drinks excluded). The family also run a school for students to learn tradition Turkish hand weaving and you can see the process with real techniques used from thousands of years. FLEXIBILITY: This is your day so it’s all about you and we can adapt to your interests within reason. If you wish to visit a different museum or sights instead of those listed, please send us a request. If you have any other places of interest that you may want to visit, we are able to quote those as additional cost to your tour. 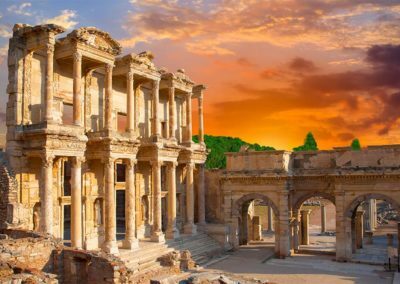 This is a day where you get to really see not only the sights, but what it is like to live, breath and taste the city of Ephesus and Kusadasi. From the moment we meet you at the Port of Kusadasi our driver and guide will take care of you so that you can sit back and enjoy your day in Ephesusa. Any last minute adjustments, within reason, can be made if you have had a change of heart. 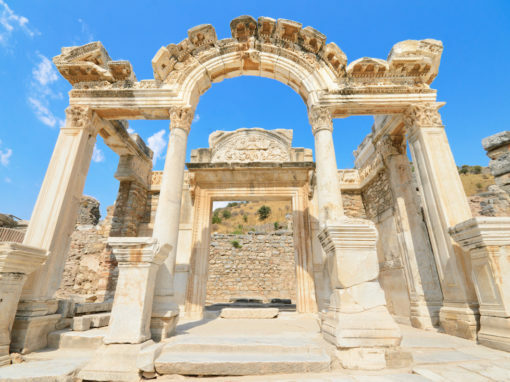 Our first stop is to see the 7th wonder of the ancient world, EPHESUS. Dating back 3000BC this city has been one of the most important stops for tourists since even the time of Romans. 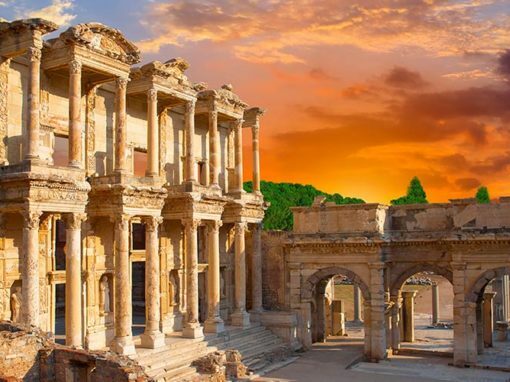 Skipping the lines, we take you into the heart of history, to Odeon, the temple of Hadrian, Roman baths, an ancient theatre and of course the Celsus Library famed in more than a few ways. After we explore this amazing sight, a well needed break away from the crowds and heat is needed and this is the gem of the day… visiting a local family run farm and carpet making school. Not a touristy place , but this school teachers young local girls the ancient art of handwoven carpets, and here you can learn firsthand what is real or not. The Family prepare a local lunch served in the shade of the olive tree garden and it is chance to experience true Turkish hospitality. After a rest and lunch we can take you either to the quaint village of Sirince ( a mixture of Turkish and Greek culture) or to the House of the Virgin Mary or the Basilica of St John. Ending the day we return to Port and there is still time to relax and enjoy the streets and port of Kusadasi. It’s your choice and freedom to make it your special day in Kusadasi. Every day, except 25th December. Walking is a part of this trip, so please bring comfortable shoes. Bring a bottle of water and sunscreen during the summer time. 1. Maximum depends on number of people in your Group of friends and Family. JUST for you. 2. Minimum Participates 1 at cost of 2pax. 3. Included Entrance to Museums and Places of Interest subject to Opening Times/days and availability of tickets. 4. Weka Travel reserves the right to revise or cancel any part of the tour due to acts of God, traffic delays, or last minute closures. See Terms and conditions for details on closures of Museums, cancellations, changes to Itinerary and other information. We have a range of special vehicles that can handle anything including Wheelchair lifts. TOUR TYPE – PRIVATE EXCLUSIVE. up to you as it just for you and your friends & family. email: [email protected] | phone: +64 9 88 99480 | mobile: + 39 346 3612078 | © Copyright 2017. Weka International.